Home › News › Young Muslims “Fuel Huge Rise In Sharia Marriage”? Young Muslims “Fuel Huge Rise In Sharia Marriage”? 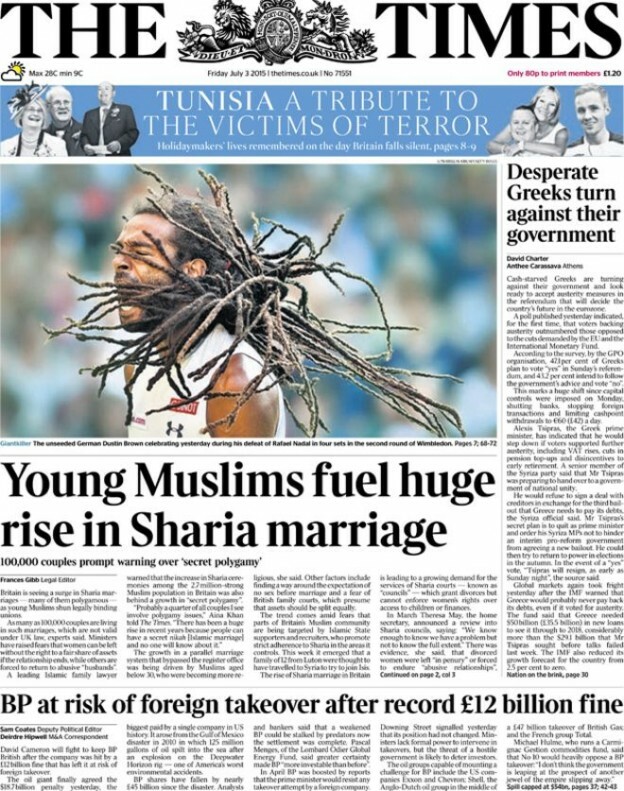 The Times front page today runs a curious headline: “Young Muslims fuel huge rise in Sharia marriage”. The headline is a bit like the paper’s declaration last year of a “rise in the Muslim birthrate” that was, it turns out, non-existent. So, it is the same with the strange proclamation that young Muslims are fuelling a rise in sharia marriages. Given that all Muslim marriages are such by virtue of adhering to the requirements of shari’ah, and the age profile of British Muslims is the youngest of all faith groups (48% of British Muslims are under the age of 24 according to the 2011 census), more of them getting married results, ipso facto, in more shari’ah marriages. It’s a no brainer really so why the front page headline? Turns out the newspaper article is about the number of such marriages, which are not supplemented with civil ceremonies which would grant the union legally binding status under civil law, thus leaving them at the mercy of shari’ah tribunals. There are two things that arise from this (a) how to register nikah marriages so that they are legally binding under religious and civil law (b) the operation of shari’ah tribunals in cases of marriage failure. In our manifesto for the 2015 election we iterated the same calling on Government to introduce proposals that would end the anomaly of Muslims effectively undergoing two marriage ceremonies. There has been no policy proposal advanced to that effect though the Government has not shied away from focusing on the second point, on shari’ah tribunals. The Times coverage today is somewhat paradoxical with the main article mentioning the statement by the Home Secretary, Theresa May, about initiating a review of shari’ah tribunals in order to address the issue of gender equality. Interestingly, other religious courts operating under the Arbitration Act, such as Beth Din courts, which have also been accused of transgressions against gender equality are not to be reviewed at all. And then, The Times prints a secondary article covering the work of a shari’ah tribunal in Birmingham, on which Amra Bone serves, and documents the ways in which it is able to provide Muslim women with the means to escape overbearing or errant husbands by dissolving their marriage contract. If shari’ah tribunals offer a service to women that they are not able to avail themselves of elsewhere, and women frequently make use of the service, surely less scaremongering about them and more transparency over the work they do is to be promoted? Indeed, even when civil marriage contracts are dissolved, Islamic marriages may not be and shari’ah tribunals enable women to move on with their lives by freeing women from marriages that their former husbands sometimes refuse to relinquish them from. It is very much like Jewish women and obtaining a ‘get’ divorce, though of course these parallels are not mentioned in the headline article or secondary one. The Times further complicates matters by suggesting the “huge rise in Sharia marriages” comes “amid fears that parts of Britain’s Muslim community are being targeted by Islamic State supporters and recruiters, who promote a strict adherence to Sharia in the areas it controls.” Quite what the two have to do with each other is not clear. So The Times makes references to a “parallel marriage system,” to young Muslims who are “becoming more religious,” to a “huge rise in Sharia marriages” and to Islamic State in the same article. It cannot but help to sow seeds of doubt among readers that young Muslims are living as if a “state within a state” ready to either flee to ISIL, and here the paper mentions the family of 12 from Luton who are suspected of having left for that purpose, or create their own “strict adherence to Sharia” within the UK. It is quite shocking really when there are very real issues that could quite easily be dealt with through policy interventions and practical suggestions have been put forward by those who would sensibly address the problem of dual marriage ceremonies and unregistered Muslim marriages. Why the scaremongering?